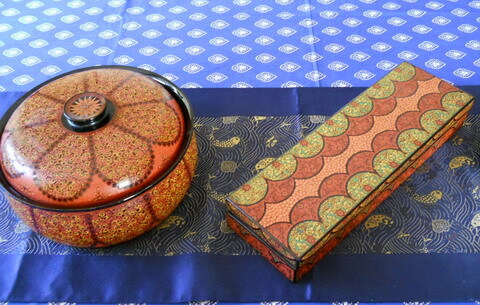 Lacquerware is the most distinctive and traditional of Burmese handicrafts. 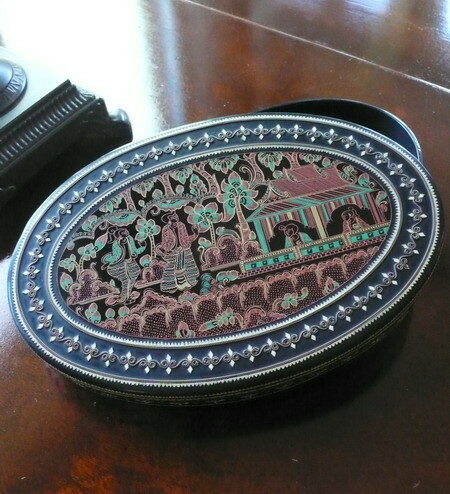 Traditionally it was used by royalty for storing documents and jewelry, and more commonly for keeping betel nuts and food. This craft dates back to the 13th century. Today, one can find a wide variety of lacquer items in Burma, from trays to storage chests, bowls, tables and even chairs. Considering the time it takes to produce even the smallest piece (at least 5 to 7 months), lacquer is still quite inexpensive. How it is madeBasically, items are shaped using coiled or woven Bamboo or carved wood, and then they are lacquered using the sap of a particular tree that flourishes in Burma. For objects of particular high quality, fine horsehair is used. To prevent cracking, some makers include cloth. After the shape is made, the first coat of lacquer is applied by hand. It is then dried for a week in underground cellars (drying in the sun causes pockmarks). A second coating is applied; once again the object is dried for another week. The next stage involves using powdered buffalo bone, teak sawdust and lacquer to fill up crevices. The object is then polished to remove rough spots, and then it is lacquered and dried again. After another week, it is polished again using clay and stone. It is polished three more times and then stored underground for one month. After this it is polished again. This is followed by a long process of lacquering and drying over a period of about seven weeks. After this, the designs will be etched in color by color using fine etching tools and acacia glue. After each color is applied, the object is dried for a week. Once all the designing is done and all colors have been applied, it is dried for one month and then for 10 minutes in the sun. It is polished and its insides may be painted once more with red lacquer. After one week of drying, the object is finished! The finest pieces take up to one year to complete using this painstakingly slow process. But the results are spectacular!! Care of Your Lacquer PieceYou can wash with water and mild soaps. Please do not put the item in dishwater and do not use abrasive soap. To lessen the chance of cracks and deterioration, please do not place it in direct sunlight. Avoid extremes in temperatures, particularly in colder climates. Extreme heat or cold can cause fine cracks to appear.